May 5th, 2008 : Sunny and Warm, Water Temp 68* and Clear. Picked clients up at 4:30 and caught bait. Set up on a 15 foot flat pulling boards and after an hour of fish swirling our baits with no hook-ups I moved on. Ran a couple more flats with no luck and decided to try downlines over deeper fish. 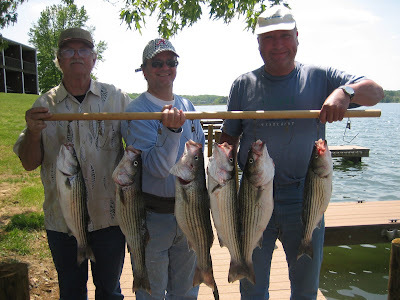 We ended up struggling to catch a dozen Stripers with clients keeping half of them.